Bu-Shen-Jian-Pi formula (BSJPF, 补肾健脾方), a combination of Si-Jun-Zi decoction (SJZD, 四君子汤) and Liu-Wei-Di-Huang decoction (LWDHD, 六味地黄汤), can nourish kidney Yin and replenish spleen Qi, and it is the basis for improving liver–kidney Yin deficiency with spleen deficiency pattern. Previous clinical studies have proved that BSJPF achieves a significant effect in patients diagnosed as such a pattern after liver cancer and intestinal cancer surgeries and can improve patient's quality of life and immunity and prolong the survival time., Experimental research suggests that BSJPF and its decomposed ingredients have inhibitory effects on transplanted liver cancer in mice and promote tumor cell apoptosis. However, the composition of BSJPF is complex, and its multitarget and multipathway regulatory mechanisms are still unclear and deserve further study. Network pharmacology is a new discipline that selects specific signal nodes for multitarget drug molecule design through multitarget network analysis of biological systems., In recent years, with the development of network pharmacology technology, it has provided technical support for the research on the mechanism of traditional Chinese medicine (TCM) compound formulae. One of the main means is to clarify “multicomponent, multitarget” complex action mechanism of TCM formulae using network pharmacology technologies. We applied this pharmacology to predict the chemical compounds and its target of BSJPF and tried to explore its pharmacological mechanism of compounds through a network pharmacology approach. Databases include TCM systems pharmacology (TCMSP) (http://tcmspnw.com), TCM Database@Taiwan (http://tcm.cmu.edu.tw), DrugBank (http://www.drugbank.ca), Uniprot (http://www.uniprot.org/), and DAVID (https://david. ncif cr f.gov). 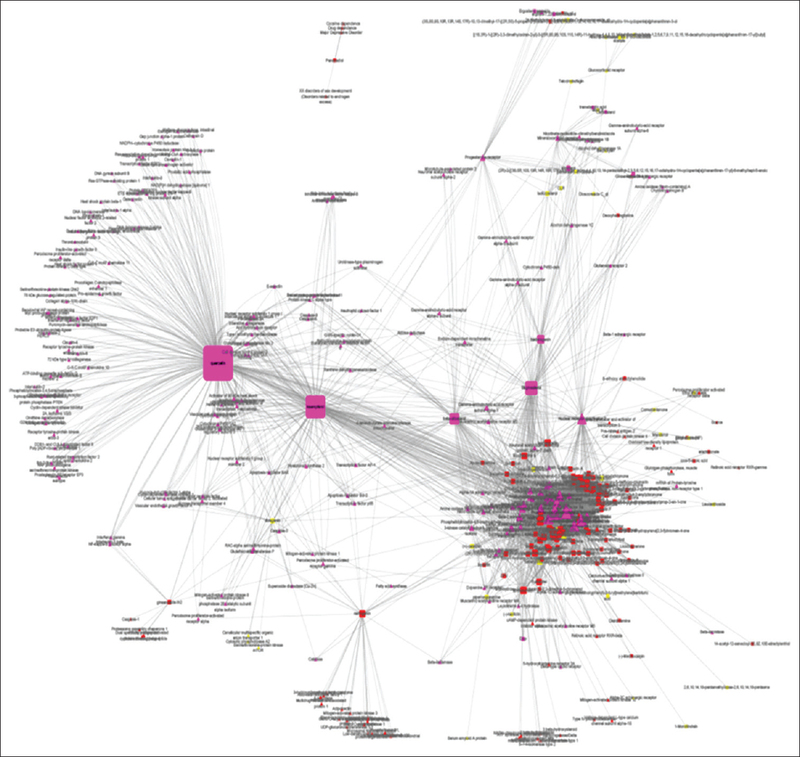 Cytoscape 3.4.0 and Excel 2007 were used in the analysis. Oral bioavailability (OB) refers to the quantity and rate at which the drug is absorbed into the systemic blood circulation after oral administration of the drug, and it is the most important pharmacokinetic parameter of the drug properties, that is, absorption, distribution, metabolism, and excretion. High OB is often a key indicator of the drug-like (DL) properties of bioactive molecules, that is, pharmacodynamic molecules. We used the computer model OBioavail 1.1 to predict OB of the drugs. The DL index refers to the similarity between the compound and all known drugs in the DrugBank database. Before the target prediction, we screened out those chemical compounds that are not suitable for drugs from the chemical point of view by DL index. In this study, the DL of the drug was calculated using the Tanimoto coefficient and the average DL index of all 6511 compound molecules of the descriptor was calculated based on the Dragon software (Dragon Software Inc. Falls Church, VA, US). DL ≥0.18 (the average value of the entire similarity) is considered to be similar to the drugs in the DrugBank database. Following this, we can obtain all compounds with DL properties and conduct further research. Drug molecules exert their therapeutic effects by combining with specific proteins or nucleic acid targets to modulate their biological activity. Therefore, to study the mechanism of TCM formulae, it is necessary to identify the molecules that are affected by active components of traditional Chinese herbal medicines (CHM). In combination with the target database, manual screening, random forest, and support vector machine were used for the integration and establishment of a drug-target experimental database. The construction of traditional CHM component-target network can help identify potential drug targets for each compound, understand macroscopically the mechanism of drug treatment, and discover the novel role of Chinese herbal compound. In this experimental study, we constructed the network by the Cytoscape 3.2.0 software and made use of the plug-in network analyzer to analyze three important topological parameters of network nodes, such as degree, betweenness centrality, and closeness centrality. BSJPF, a combination of SJZD and LWDHD, is composed of nine ingredients such as Radix Rehmanniae Preparata (Shu-Di-Huang 熟地黄), Rhizoma Dioscoreae (Shan-Yao 山药), Fructus Corni (Shan-Zhu-Yu 山茱萸), Rhizoma Alismatis (Ze-Xie 泽泻), Poria (Fu-Ling 茯苓), Cortex Moutan (Dan-Pi丹皮), Radix et Rhizoma Ginseng (Ren-Shen 人参), Rhizoma Atractylodis Macrocephalae (Bai-Zhu 白术), and Radix et Rhizoma Glycyrrhizae (Gan-Cao 甘草). We retrieved the components of nine CHM that make up BSJPF from TCMSP, TCM Database@Taiwan, and other traditional CHM chemical databases, totaling 2106 (380 components in R. et Rhizoma Ginseng, 110 R. Atractylodis Macrocephalae, 108 Poria, 560 R. et Rhizoma Glycyrrhizae, 152 Radix Rehmanniae Preparata, 142 R. Dioscoreae, 452 F. Corni, 92 R. Alismatis, and 110 C. Moutan). After removing the duplication, according to the thresholds of OB ≥30% and DL ≥0.18, a total of 143 components of BSJPF were selected for the study. Of these, 101 components were from SJZD and 29 from LWDHD and 13 in both. We collected and gathered drug-related targets based on the DrugBank database, therapeutic target database, and other drug-target databases. Set TCM components and related targets as the nodes of the network, we considered the relationship between them as edges and constructed TCM compound-target network in Cytoscape 3.4.0 software [Figure 1]. At the same time, we analyzed the network topology using plug-in network analyzer. There were 413 nodes and 2644 edges in this network. Among them, 143 nodes were compounds and the average degree of nodes was 18.48 (2644/143). After calculation, 48 nodes were higher than the average degree of nodes. The top 10 compounds were quercetin, kaempferol, β-sitosterol, stigmasterol, hederagenin, 7-methoxy-2-methyl isoflavones, formononetin, naringenin, isorhamnetin, licochalcone A, and medicarpin. There were 270 nodes acted as targets, of which 49 unique targets were in SJZD, 8 unique ones were in LWDHD, and 213 were in both. The average degree of nodes at these targets was 9.79 (2644/270) and 48 nodes were higher than the average value. We further searched for the “target-disease” interaction data and found that there were 334 BSJPF-related diseases, including cancer, Alzheimer's disease, inflammation, and asthma. In BSJPF targets, we performed GO function enrichment analysis and pathway function analysis for 247 targets that were higher than the average of the nodes. Eight hundred and sixty-one functions were enriched (P ≤ 0.01), including 109 pathways (P ≤ 0.01), where the most targets were enriched in the cancer pathway. Therefore, we further established the tumor-related compound-target-pathway network of BSJPF [Figure 2]. BSJPF consists of LWDHD and SJZD. The former is composed of Radix Rehmanniae Preparata, R. Dioscoreae, F. Corni, R. Alismatis, Poria, and C. Moutan mainly focused on nourishment and tonification of the liver and kidney and the latter with the ingredients of Radix et Rhizoma Ginseng, R. Atractylodis Macrocephalae, Poria, and Radix et Rhizoma Glycyrrhizae emphasized on fortifying the spleen. Poria is a common herb in both the formulas. In order to analyze the molecular mechanism of BSJPF, we sieved and analyzed the TCM components of BSJPF, detected the corresponding targets, and performed enrichment analysis on predicted targets, and compared with those in LWDHD and SJZD [Table 1]. The results showed that 1001, 1017, and 90 GOs were enriched in BSJPF, LWDHD, and SJZD, respectively, and 59, 56, and 6 target-related pathways were in BSJPF, LWDHD, and SJZD in turn. Further, we compared the GOs and the pathways predicted by the compounds of BSJPF, LWDHD, and SJZD and found that they have common GOs and pathways. GO annotation analysis showed that BSJPF, LWDHD, and SJZD all could regulate cell proliferation and apoptosis. In addition, BSJPF regulated the cell cycle and anabolism of major histocompatibility complex II molecules regulating cell differentiation in positivity. LWDHD focused on the regulation of biological and cellular processes, as well as the stress on chemical stimuli. SJZD emphasized on anabolism regulation. Pathway analysis showed that all the three were enriched in cancer pathway, nonsmall cell lung cancer pathway, and thyroid tumor pathway. There were many common pathways such as cancer pathway, colorectal cancer pathway, toll-like receptor pathway, T-cell receptor signaling pathway, and P53 signaling pathway, and apoptosis. In addition, LWDHD acted exclusively on the Wnt signaling pathway, natural killer cell cytotoxicity (NKCC), and lymphocyte migration and other signaling pathways. However, for SJZD, there was no independent pathway. The use of network pharmacology characterized by multicomponent, multitarget, and complex network has a great prospect for research on the mechanism of Chinese medicine compound and the discovery of new drugs. In particular, the human body is regarded as a complex network in TCM using the holism theory and disease indicates the imbalance of this network. Treatment is to adjust this imbalanced network and restores it to a normal state. TCM formulae has the synergistic regulation effect of biological network and the synergistic effect may come from the network connection of various drug compounds in the formula in the target of action. Using network pharmacology, Wu et al. found eight kinds of molecular targets for regulating hepatocellular carcinoma-related genes, providing important clues for subsequent drug development. We applied network pharmacology methods to collect a large quantity of “drug-target-disease” data and carried out the analysis of compound-target-disease network of LWDHD and the prediction of effect mechanism. This study further analyzed and predicted the chemical components, targets, biological functions, and signal transduction pathways of BSJPF and explored the pharmacological mechanism of BSJPF. We screened out 143 components in total, of which 101 were from SJZD and 29 from LWDHD and 13 in both. We detected 265 shared targets for BSJPF, 7 unique ones for LWDHD, and 44 unique ones for SJZD. There were 214 shared targets for SJZD and LWDHD. Interaction of 265 targets in BSJPF can regulate 334 disorders, especially cancer, Alzheimer's disease, inflammation, and asthma. Among them, cancer is related with the most targets in BSJPF. Both BSJPF and its separated formulae including LWDHD and SJZD can regulate cell proliferation and apoptosis. LWDHD can positively regulate biological and cellular processes and regulate stress on chemical stimuli. SJZD focuses on anabolism regulation. All three formulae are enriched in cancer pathway, nonsmall cell lung cancer pathway, and thyroid tumor pathway. 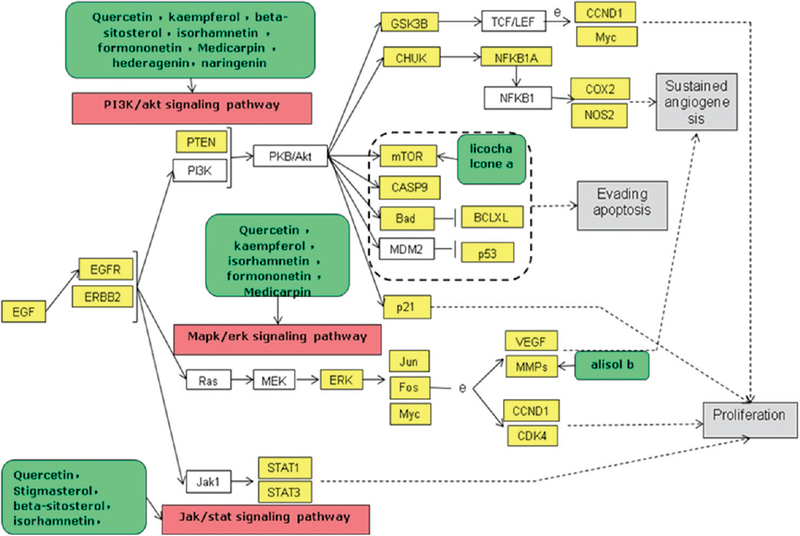 Many intersected pathways such as cancer pathway, colorectal cancer pathway, toll-like receptor pathway, T-cell receptor signaling pathway, and P53 signaling pathway and apoptosis were involved in the cancer-related regulation. In addition, LWDHD acted exclusively on the Wnt signaling pathway, NKCC, and lymphocyte migration and other signaling pathways. However, for SJZD, there was no independent pathway. The results suggest that BSJPF exerts a synergistic effect of “1+1>2” in the combination of kidney tonification by LWDHD and spleen reinforcement by SJZD. The effect and mechanism of BSJPF and its components on cancer will be verified by further experimental research. Furthermore, we were looking for BSJPF acting on pathways in tumor-related pathways, built the related compounds-targets-pathways network and analyzed the topological property of the network. We find the node degree and centrality of quercetin, kaempferol, β-sitosterol, stigmasterol, hederagenin, formononetin, naringenin, isorhamnetin, licochalcone A were the highest in the network, and only alisol B acting on the tumor-related pathways in all compounds of alisma, its target was MMP2, which was related to the invasion and metastasis of tumor cells. In addition, in the tumor-related pathways, targets were more concentrated in the PI3K/Akt pathway and the MAPK/ERK signaling pathway [Figure 3]. This work was supported by the Key Program of National Science Foundation of People's Republic of China (81330084). Wang WH, Zhou RY, Zou J. Clinical observation on 50 cases of colorectal cancer treated by Chang-Yi decoction. ZhejiangJ Integr Tradit Chin West Med 2000;6:11-2. Wang WH, Zhou RY, Yan ZP, Lin JH, Ye ZB, Wu DM, et al. Effect of Bu-Shen-Jian-Pi formula on cellular immune function in patients with primary hepatocellular carcinoma after surgery intervention. Chin J Integr Tradit West Med 2008;28:583-7. Zhong Y, Luo CL, Zhang AJ, Zhao X, Zhou RY, Liu H. Effect and difference of Bu-Shen-Jian-Pi formula and its disassembled prescription on tumor growth of transplanted hepatocarcinoma mice. Chin J Integr Tradit West Med 2011;31:213-7. Hopkins AL. Network pharmacology. Nat Biotechnol 2007;25:1110-1. Hopkins AL. Network pharmacology: The next paradigm in drug discovery. Nat Chem Biol 2008;4:682-90. Zhang GB, Li QY, Chen QL, Su SB. 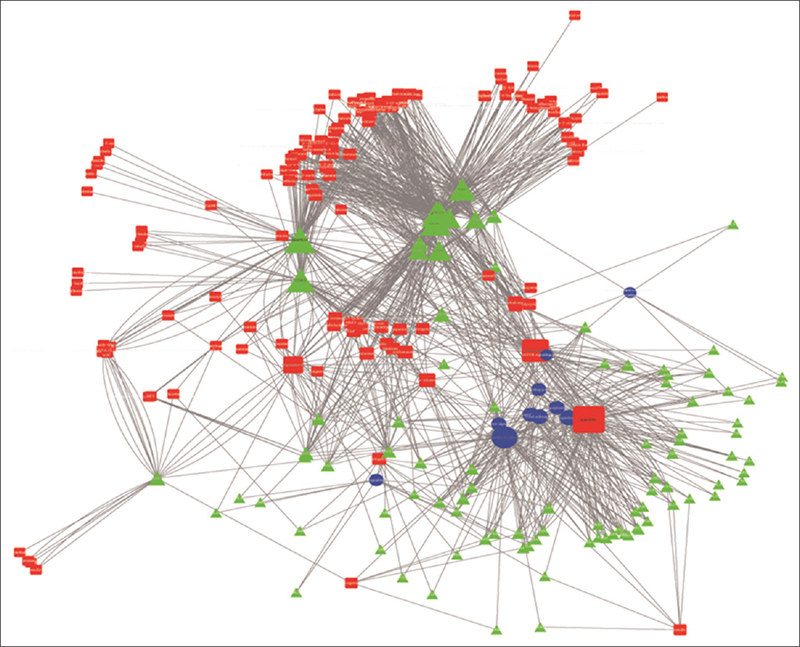 Network pharmacology: A new approach for Chinese herbal medicine research. Evid Based Complement Alternat Med 2013;2013:621423. Xu X, Zhang W, Huang C, Li Y, Yu H, Wang Y, et al. A novel chemometric method for the prediction of human oral bioavailability. Int J Mol Sci 2012;13:6964-82. Walters JR. New advances in the molecular and cellular biology of the small intestine. Curr Opin Gastroenterol 2002;18:161-7. Sao Li. Research model and practice of traditional Chinese medicine formulae based on biological network regulation. J Integr Med 2007;5:489-93. Gao L, Wang XD, Niu YY, Duan DD, Yang X, Hao J, et al. Scientific reports. Molecular targets of Chinese herbs: A clinical study of hepatoma based on network pharmacology. Sci Rep 2016;6:24944. Li XY, Dong S, Wei B, Chen QL, Cai FF, Wang WH, Compound-target-pathway network analysis and effective mechanisms prediction of Liu-Wei-di-Huang decoction. Chin J Exp Tradit Med Formulae 2017;23:221-7.